"How does reactive behaviour decompose? What can be done to encourage stepwise refinement of the behavioural aspects of a system? How can one cope with the intricacy, that the behaviour of a complex reactive system presents??" 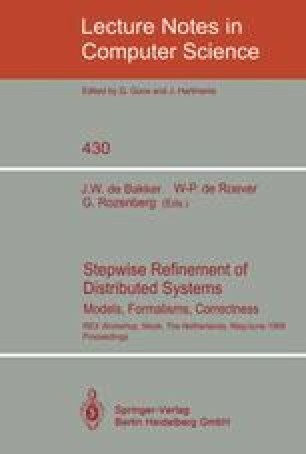 These questions, posed in [HP85] and informally discussed there in the setting of statecharts, are taken up in this paper using a particular class of Petri-Nets as models for open reactive systems. It presents an assumption/commitment style temporal logic [Pn85] for specifying the behaviour of such systems, an automatic proof method for verifying the correctness of an implementation of such a specification in terms of the considered class of Petri-Nets based on modelchecking of MCTL formula (discussed in a companion paper [Jo89]), and presents a proof-method for infering the behaviour of a compound reactive system from the behaviour of its constituents.